Form 150203 is a Nevada Secretary of State form also known as the "Certificate Of Amendment To Certificate Of Designation For Nevada Profit Corporations Before Issuance Of Class Or Series". The latest edition of the form was released in January 5, 2015 and is available for digital filing. Download a PDF version of the Form 150203 down below or find it on Nevada Secretary of State Forms website. 4. 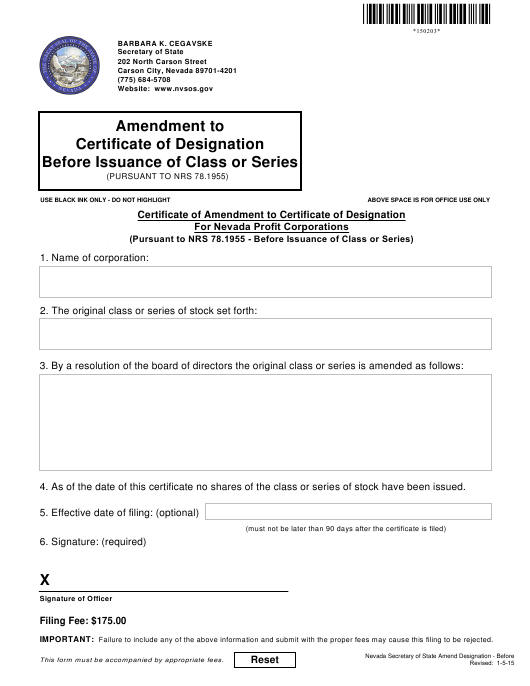 As of the date of this certificate no shares of the class or series of stock have been issued.